The National Rugby League is one of Australia’s biggest and most recognisable football competitions. The NRL attracts the best players from around the world to strut their stuff in the premier competition on the planet, with the fiercest hits, biggest bodies and unrivalled passion. The sport has many different trophies ranging from team performance, grand final wins, individual brilliance and representative glory. This page will guide you through the main trophies in the NRL, what they are, and how you can bet on them. 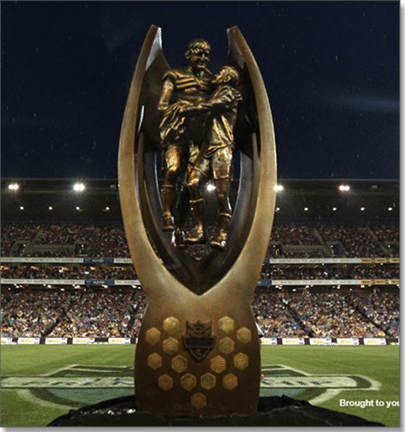 The Provan-Summons Trophy is the main prize in the NRL, awarded to the team that wins the NRL Grand Final. The trophy is modelled after the Winfield Cup, which was awarded to the winner of the NSWRL Grand Final from 1982 to 1994. That was retired after cigarette manufacturer Winfield was forced to withdraw its sponsorship following a change in Australian legislation. A remodelling of the trophy was designed after the withdrawal of the sponsorship, but it was not until 2013 that it was officially named the Provan-Summons Trophy. The State of Origin Shield is awarded to the team that wins the state representative game of rugby league between the Queensland Maroons and the New South Wales Blues. Since its inception in 1980, State of Origin has become rugby league’s crown jewel and is without a doubt among the most popular, fiercely contested and spiteful sporting events of the year in Australia. The Dally M is awarded to the best and fairest player throughout the duration of the NRL home-and-away season. In both the New South Wales and the Brisbane Rugby League competition, the best player of the respective leagues received the Rothmans Medal. The Dally M Medal was awarded by News Limited publications from 1980 until 1998, when it became the official Player of the Year award for the newly formed NRL. Several other awards are doled out on Dally M night, including Captain of the Year, Coach of the Year, Top Tryscorer of the Year, Top Pointscorer of the Year and the Peter Moore Award for Rookie of the Year. The Dally M Team of the Year is also announced. The JJ Giltinan Shield is awarded to the team in the NRL that finishes on top of the ladder at the conclusion of the home-and-away season. The trophy is named after James J Giltinan, who was one of the figureheads in the formation of rugby league in Australia. Giltinan died in 1950 and the shield was introduced the year after. The shield was originally awarded to the grand final winner of the NSWRL, but since 1997 it has gone to the minor premiers. Credit card and debit card deposits are available on every Australian sports betting site. All transactions are secure and money can be transferred to and from your card once your account is verified. POLi is a real-time debt payment system designed especially for Australia and New Zealand. Money is debited from your account and transferred straight into your online bookmaking account. PayPal is one of the world’s most popular online spending systems. It offers users a safe way to make payments from their credit card, debit cards, or bank account without exposing sensitive information to the web. BPAY debits work exactly the same as when you pay a utility or phone bill. Each online bookie will have its own unique BPAY transaction number and biller code.